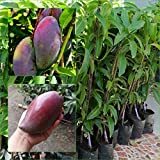 Mango tree for sale – Although you can start growing a mango tree from seed, it is not recommended since the fruits quality maybe different from its mother plant. When buying a mango tree for sale, choose a grafted plant which has faster fruiting in 3 to 4 years compared to seeds that may take up 7 to 10 years before yielding. Location – try to choose a place with the most hours of sunlight possible. Avoid areas that tend to flood. Mangos like to be on higher, drier ground for better drainage. This plant also prefers acidic sandy soil in order to thrive. Planting – dig a hole that is three times as wide as the root ball and just as deep. Place the tree in the hole, making sure that it is level with the surrounding ground. It is not possible to plant mango trees indoors, but you can grow them in pots or containers. Watering – water once every three days for the first 6 weeks after planting. After that, you may cut back to once every week but make sure to increase the amount during hot summer days. Fertilizer – Avoid chemical fertilizers as much as possible because mango trees burn easily with fertilizers high in ammonium nitrate choose a natural organic fertilizer with beneficial bacteria and mycorrhizal fungi. Pollination – mango trees are self-pollinating. They will produce fruits by themselves. If you want to increase the fruit yield, it is advisable to plant another mango tree and encourage bees to aid in cross pollination. Pruning – the best time to prune a mango tree is after a harvest. Remove dead or infected branches. You may also do tip pruning to encourage lateral growth and increase the crop production. Ideally, prune a little every year. Harvesting – The hotter the weather the faster the mangoes ripen. You can also harvest mangoes that are half-ripe. Be careful not to get sap on your skin while harvesting fruits as it may cause burns, allergies and dermatitis. The best way to harvest mangoes is to cut them off with a long section of stem still attached, and to handle them carefully so that the stem does not snap off. Pests and Diseases – the most common disease of mango trees is anthracnose. It is a fungus that will cause your fruits to go black and fall off. It can also cause black spots on the stem and small fruits and leaves may go brown. It is more common in areas where it rains during flowering and fruit set. To combat this, make sure your tree is mulched well at the base and kept healthy by adding compost. Although there are newer mango varieties that show good resistance to anthracnose, you may want to choose those varieties for your garden.